Converts, so important to the evangelical movement, are now looked upon with suspicion—the more fervent, the more suspicious. In local barbecue joints, diners, and watering holes, the proprietors are careful not to let FOX News linger onscreen too long, fearing political discussions that could be misconstrued. After all, you can never be too sure who’s listening. Come Sunday, the ministers who once railed against abortion, gay marriage and Hollywood as sure signs that the US is descending into godlessness will mute their messages. They will peer out at their congregations and fear that some faces aren’t interested in the Gospel, or maybe are a little too interested in every word. The once vibrant political clubs at Bob Jones University have become lifeless as students whisper about informants and fear a few misplaced words could leave them in a government database or worse. Naturally, none of this is actually happening to evangelical Christians in South Carolina, across the South, or anywhere else. It would never be tolerated. Yet the equivalents of everything cited above did happen in and around the New York metropolitan area—just not to white, conservative, Christian Americans. But replace them with American Muslims in the New York area and you have a perfect fit, as documented by the recent report Mapping Muslims. And New York is hardly alone. The program, which continues today, looks something like this, according to Mapping Muslims: “rakers,” or undercover officers, are sent into neighborhoods to identify “hot spots”—mosques, schools, restaurants, cafes, halal meat shops, hookah bars—and told to chat up people to “gauge sentiment,” while setting up “listening posts.” “Crawlers,” or informants, are then recruited and sent to infiltrate mosques and religious events. They are ordered to record what imams and congregants say and take note of who attended services and meetings. When people fear the police, tips dry up, potentially making the community less safe. This is important, especially given that the Muslim-American community has helped prevent, depending on whose figures you use, from 21 percent to 40 percent of all terrorism plots associated with Muslims since 9/11. That’s grounds for cooperation, not alienation: a lesson that would have been learned by a police department with strong ties to and trust in the community. Last November, West Point’s Combating Terrorism Center published a report on America’s violent far-right extremists. Its numbers were even more startling than START’s. “The consolidated dataset,” writes report author Arie Perliger, “includes information on 4,420 violent incidents that occurred between 1990 and 2012 within US borders, and which caused 670 fatalities and injured 3,053 people.” Perliger also found that the number of far-right attacks had jumped 400 percent in the first 11 years of the 21st century. 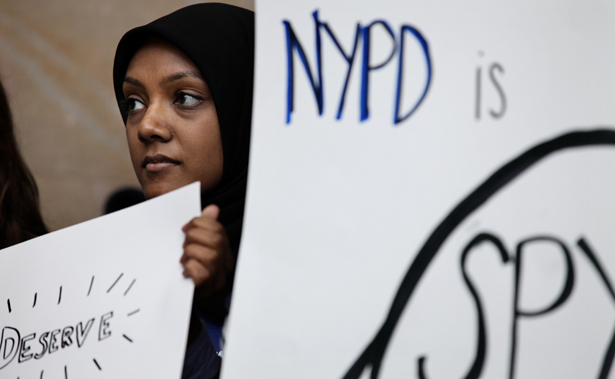 Simply put, there is an unhealthy obsession among American law enforcement agencies (and American society at large) with stopping violence perpetrated by American Muslims, one that is wholly out of line with the numbers. There is no doubt that the events of 9/11 play into this—never mind that not one hijacker was American—but there is something much darker at work here as well. It’s the fear of a people, a culture, and a religion that most Americans do not understand and therefore see as alien and dangerous. Since 9/11, the FBI has used tactics that clearly raise the issue of entrapment in arresting hundreds of Muslims inside the US on terrorism-related charges. Investigative journalist Trevor Aaronson, author of The Terror Factory: Inside the FBI’s Manufactured War on Terrorism, did the hard work of compiling and analyzing all of these cases between September 11, 2001, and August 2011. What he found was alarming. Those numbers, however damning, still don’t fully reflect the inequity American Muslims face within the US criminal justice system when it comes to terrorism allegations. An analysis of two separate but similar cases offers a clear sense of how terrorism allegations targeting the American right and American Muslims in the criminal justice system can end with very different results. The common question running through two federal terrorism prosecutions—one against a group of seven anti-government right-wing Christian paranoids, better known as the Hutaree Militia, and the other against a Massachusetts pharmacist and Islamic radical—is what kind of speech is protected by the First Amendment and just who can rest safely under its shield? In late March 2010, FBI raids led to the arrest of members of the Hutaree Militia across the Midwest. A Christian Patriot militia, Hutaree members believed that the end of the world was near and local, state, and federal law enforcement officers were actually “foot soldiers” in the “New World Order.” According to the federal indictment, Hutaree leader David Brian Stone, Sr., planned the murder of a local police officer. But that was just to be the bait. When law enforcement from across the nation attended his burial, the Hutaree would attack the funeral procession with improvised explosive devices and other homemade bombs, sparking a revolt against the government. According to the federal government’s case, Mehanna and two associates went to a terrorist training camp in Yemen in 2004 with the intention of later making their way to Iraq to resist the US occupation of that country. Mehanna countered that he went to Yemen to study Islam and learn Arabic. Whatever Mehanna intended, we know that, in fact, he never made it to any terrorist training camp. The distinction didn’t matter. Mehanna is currently serving a 17½-year sentence in a federal supermax prison. His thought crime: engaging in the same kind of violent but constitutionally-protected online advocacy regularly engaged in by white supremacists and anti-government militias on the radical Right. The media criticized Trayvon Martin's best friend Rachel Jeantel when she testified at George Zimmerman's trial—but why didn't they do the same to Zimmerman's friends?